It helps one's critical discernment to grow when you acknowledge that the first time you watched a movie, you not only missed the boat; you missed the dock, and maybe the whole damn ocean. And when I saw Love Is Strange at the Sundance Film Festival in January, I somehow ended up reacting to the story I was expecting it to be, rather than the story it is. 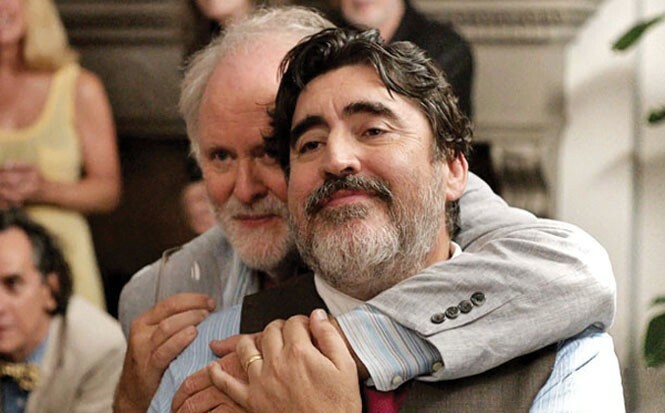 At the center is a beautifully nuanced relationship between Ben and George (John Lithgow and Alfred Molina), partners of 39 years who finally get a chance to marry legally just as financial troubles strain their ability to be together. George, a music teacher at a Catholic school, loses his job, and as a result, they're forced to move out of their apartment and live separately—George with much younger neighbors, and Ben with his nephew (Darren Burrows) and his wife (Marisa Tomei) and son (Charlie Tahan). There are some nicely observed moments in both of those scenarios—George resignedly dealing with being an older man out of place among party people, and Ben finding himself always underfoot as family tensions emerge. Yet there's an initial frustration that we're not seeing enough of George and Ben together, even as we watch the institutional realities that conspire to keep them apart. It took that second look to realize that director/co-writer Ira Sachs hasn't simply made Love Is Strange about the obstacles facing a loving gay couple trying to be together. It's about the strangeness of love in all its forms, with Sachs' quiet, observational style capturing tensions on a small scale between the ideal we hope for in our interactions—with friends, with family, with lovers—and reality as it unfolds in front of us. If anything, Love Is Strange needs more than 94 minutes to explore more deeply the many different ways people who love one another can be pulled apart, or pulled together. Love Is Strange is not showing in any theaters in the area.